The anti-diet bible that calls time's up to poisonous beliefs about food, weight and worth. DIETING DOESN'T WORK Not long term. In fact, our bodies are hardwired against it. But each time our diets fail, instead of considering that maybe our ridiculously low-carb diet is the problem, we wonder what's wrong with us. But it's time we called a spade a spade: Constantly trying to eat the smallest amount possible is a miserable way to live, and it isn't even working. So f*ck it. Caroline Dooner tackles the inherent flaws of dieting and diet culture, and offers readers a simple path to healing their physical, emotional, and mental relationship with food. What's the secret anti-diet? Eat. Whatever you want. Trust that your body knows what it is doing. Oh, and don't forget to rest, breathe, and be kind to yourself. 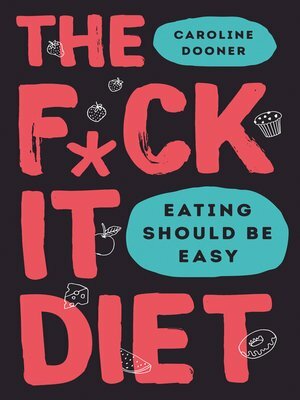 Irreverent and empowering, The F*ck It Diet is call to arms for anyone who feels guilt or pain over food, weight, or their body. It's time to give up the shame and start thriving. Welcome to the F*ck It Diet. Let's Eat.